Saturday, August 24 2019 7:00 a.m. Registration is required. Register for the 2019 event HERE. Event registration is limited to 550 participants. Sign-up early to guarantee your spot. Start Line: The start line will be at Soldiers Memorial Field. 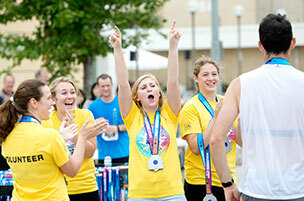 Pacers will be present to assist you achieve your half marathon time goal. Pacers will be provided by TerraLoco and will lead runners to the finish line in the time indicated on the sign each will carry showing their designated timed goal. 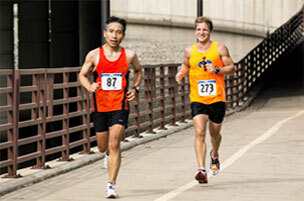 A pacer is an experienced runner will run at a pre-determined and consistent pace per mile in the half marathon. Other runners will follow or stay at that pace per mille to ensure that they are running at their desired speed. The Terraloco pacer will be a steady, consistent runner who will be focused on maintaining their speed and helping runners realize their goals. Running with a pacer will permit you to focus on your running without having to expend any mental energy on your pace. Keep your eyes on the pacer, focus on your running form, and listen to your body. There is no need to sign up prior to the race. Just find the designated pacer at the start line closet to your time goal and join the group. Based on half marathon finishing times, the following pace groups are available: 1:40, 1:45, 1:50, 1:55, 2:00, 2:10, 2:15, 2:20, and 2:30. There are 7 aid stations on the course serving up water and Gatorade. These are located at miles 2, 3.25, 5, 6.8, 8.5, 10 and 11.8. Port-a-johns are located at the Start and Finish and adjacent to every aid station. Medical support is available along the course and at the finish line. Overall winners and age group winners receive special recognition at an awards ceremony at Soldiers Field immediately following the event. Awards will not be mailed out. You must pick up your award in person or have someone pick it up for you.